I am not one of those who can conjure the greatest dishes in the kitchen. What I mean is that I don’t really know how this and that is done, which means the list of dishes that I can cook is rather small. Apart from that I am too lazy to cook and too lazy to learn other dishes or new things. However, the dishes I can cook, they are perfect, and I know, self-praise is no recommendation. But there are moments when you think you have outdone yourself. Today it happened again, that’s why I am excited right now. I cooked a noodle dish today, or more specifically noodles with bolognese sauce. That was tasty! The thing is, even if there is not a big list of recipes stored in my head, I become at least very creative with the dishes and do add different things than there should be. Pasta bolognese might sound like a standard dish, but when I cook it, I do it different because I add things that not everybody would add. There are certain things that I like and that do totally fit to pasta and bolognese sauce in my opinion. Of course, onions and paprika can’t be absent, but I still would say this is standard for spaghetti or pasta bolognese. No, what I additionally love to use is zucchini, egg plants and chili peppers. I usually ask for very spicy chili peppers but then I do also not use more than two of them. 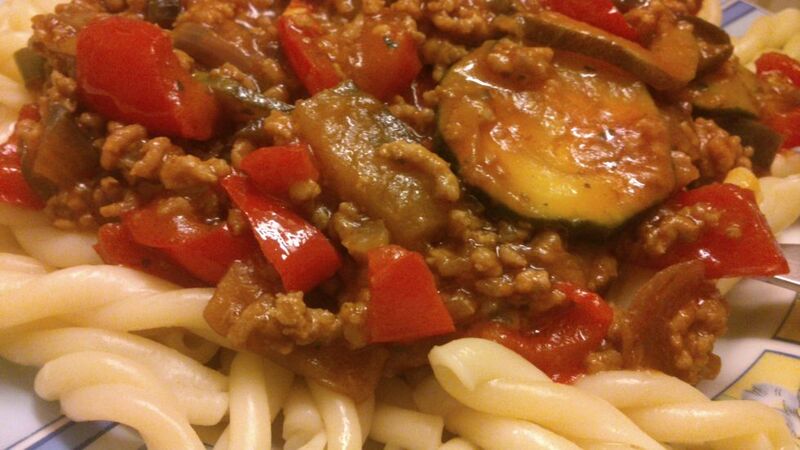 I love the combination of vegetables I mentioned, I really love it because this goes so well together with the bolognese sauce, the noodles and the minced meat, that I totally get excited when I eat that. I do roast the vegetables gently, and then I do roast the meat and boil the noodles. Later everything comes together into the sauce so that I can boil it together but not too long. Sadly I use an instant sauce, so, I still would like to learn how I can create my own bolognese sauce, and maybe I will ask Google some day. However, even if I use this instant bolognese sauce, my dish was so tasty again today and the timing was perfect. It’s just that the combination works so well, that I just can say again, I love it. Even if I am sometimes too lazy to cook, I should remind myself that it is very rewarding if I did. Apart from that it is also more healthy than eating any kind of fast food. I do cook regularly but I do also eat quite a lot of fast food. I think I should do this less and rather cook great things more often on my own. You’re not much different than. That is exactly my problem. 😀 I know that cooking is much more healthy and more tasty than fast food… it’s just that I don’t have that time and motivation every day too 😀 Exactly the same reason.. however, I think I should cook real stuff more often. That blog post made me think! I just published a blog post about recipes that don’t take too much time especially when you just can’t be bothered! Thanks for sharing your Bolognese recipe too!